Lot # 35: 1956 Topps Ernie Banks “Gray Back” (PSA Mint 9) – Highest Graded Copy! 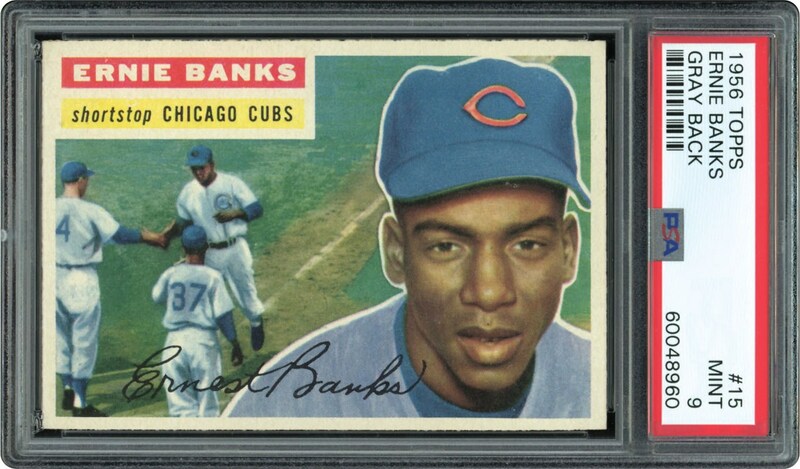 1956 Topps Ernie Banks "Gray Back" (PSA Mint 9) – Highest Graded Copy! Not often does a 62-year old "Mint 9" cardboard issue of a great Hall of Fame player surface, but such is the case for this breathtaking 1956 Topps Ernie Banks "Gray Back" marvel. Graded an incredible PSA Mint 9, it stands as one of only 5 PSA encapsulated "Gray Back" copies at this stratospheric plateau with NO SGC or PSA copies graded higher! One mention of the great Hall of Fame Chicago Cubs shortstop Ernie Banks immediately inspires the concept of "let's play two"! Known throughout Chicago as "Mr. Cub", Ernie Banks clubbed 512 lifetime home runs and is still the only shortstop ever to claim to consecutive Most Valuable Player Awards (1958 & 1959). This virtually perfect card symbolizes everything all of Banks outstanding qualities primarily via its pack-fresh surfaces, brilliant colored tints, perfectly registered images and nearly "dead-on" 50/50 centering. 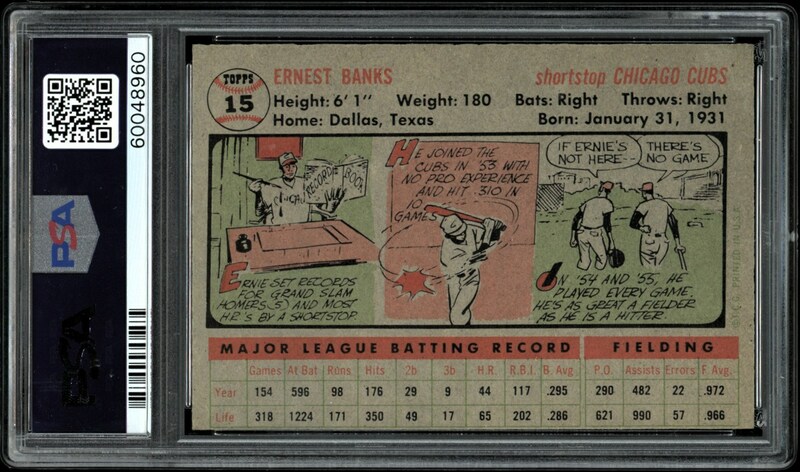 A world-class PSA Set Registry collectors dream, along with only a handful of other examples it resigns supreme on PSA's prestigious "pop" chart, with NO recorded copy for any grading company ever besting this pinnacle "Mint 9" gem!